Your payment will be processed securely by PayPal. PayPal is free, there is no additional cost to you and you are not required to have a PayPal account. Your financial information is never shared with us. 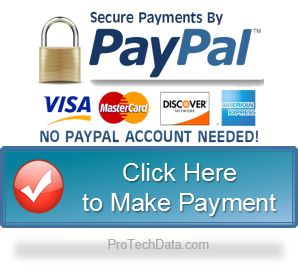 After you click CLICK HERE TO MAKE PAYMENT" button, you will be transferred to an encrypted PayPal website where you will enter your contact and payment information. Questions, comments, or concerns regarding services rendered, billing, or payments?